Finally put together the stats from my reading from 2016. Du Iz Tak? (2016) by Carson Ellis is a fascinating concept book (a group of bugs communicate with their own unique language). The illustrations evolve along with your understanding of what they are saying, reaching a satisfying conclusion. As for Caldecott potential (Mock Caldecott final ballot), however, I'm not sure. 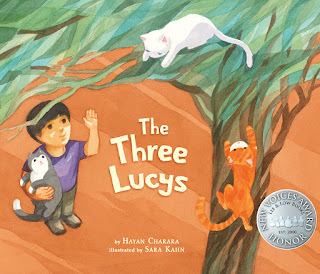 The Three Lucys (2016) by Hayan Charara and illustrated by Sara Kahn [a Lee & Low New Voices Honor book]. This story begins as a story about a young boy who lives in Lebanon with his three cats (each named Lucy), but it evolves into a story about the impact of war, inspired by the "July War" of 2006 between Israel and Lebanon (as explained in the author's note). It is a gentle book for exploring this difficult topic with younger children. I've enjoyed Scattergood's books in the past, I'm looking forward to this one! I hadn't heard of Making Friends with Billy Wong. Looks like a great book. Thanks for sharing! I think I am the only person on earth who just doesn't like Du Iz Tak? I've read it twice and I just don't feel like I get it. But I loved Making Friends with Billy Wong. Scattergood is great at making history feel personal for today's kids. I think that may be closer to how I feel. I walk away from the book saying, "So what?" You had a busy year! I really want to read Scattergood's book! Du Iz Tak? looked interesting but not something I might really want to read. But I keep seeing it on people's posts so I thought I should try to get a copy. I wonder if it is an omen to not really bother since my local library doesn't have it? Sometimes I wonder about picture books that just don't feel like they were actually written with children in mind, and are just a bit too clever or too geared towards adults (or awards). I haven't read Du Iz Tak? yet, but I've heard a few people comment that they're not exactly sure who the audience for it would be. 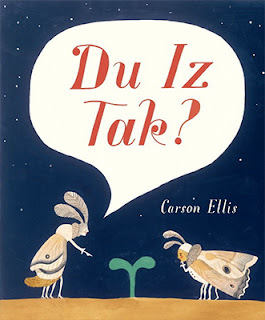 Du iz Tak certainly is unique, but it's not one that I am crazy about. I want to get the Billy Wong book. Thanks!